①Most of what we learn about the world is obtained from information based on samples of what we are studying -- samples of, say, rock formations, light from stars, television viewers, cancer patients, whales, or numbers. Samples are used because it may be impossible, impractical, or too costly to examine all of something, and because a sample often is sufficient for most purposes. 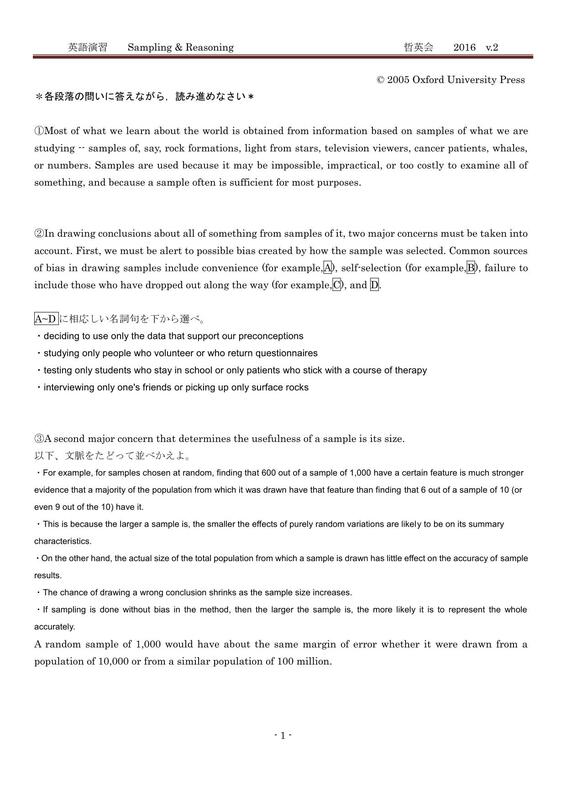 ②In drawing conclusions about all of something from samples of it, two major concerns must be taken into account. First, we must be alert to possible bias created by how the sample was selected. Common sources of bias in drawing samples include convenience (for example,A), self-selection (for example,B), failure to include those who have dropped out along the way (for example,C), and D.
③A second major concern that determines the usefulness of a sample is its size. ４The chance of drawing a wrong conclusion shrinks as the sample size increases. A random sample of 1,000 would have about the same margin of error whether it were drawn from a population of 10,000 or from a similar population of 100 million.